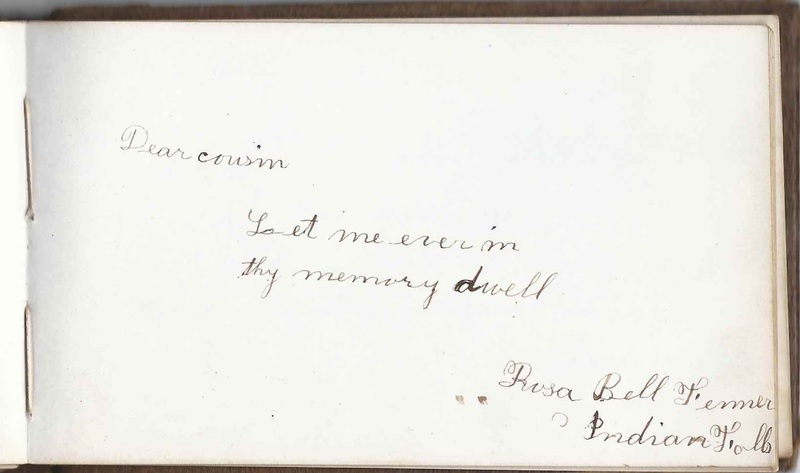 1870s/1880s autograph album that I believe belonged to Herbert A. Perry, "Bert", of Elba, New York. I was thrown off at first when two signers indicated a sibling relationship with him, but I believe they were actually the younger siblings of his stepmother. 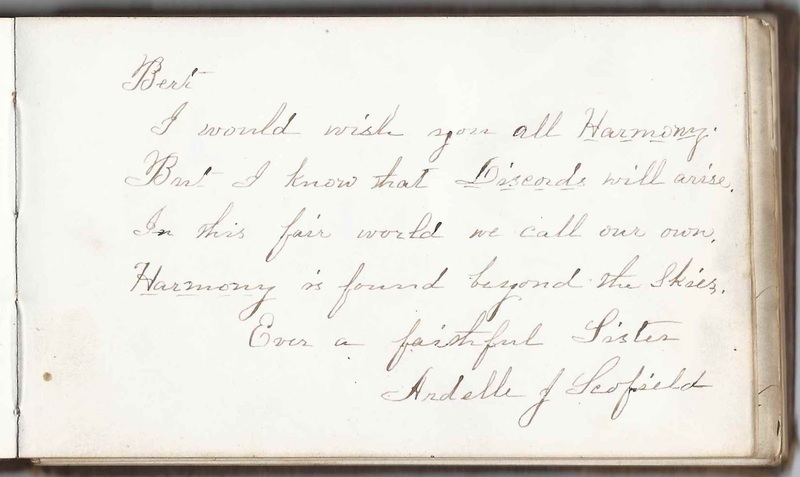 The handwriting on the presentation page looks very similar to that of Bert's step aunt Ardelle Josephine Scofield, who signed the following page in the album, so it's likely that this album was a Christmas present to Bert from Ardelle. 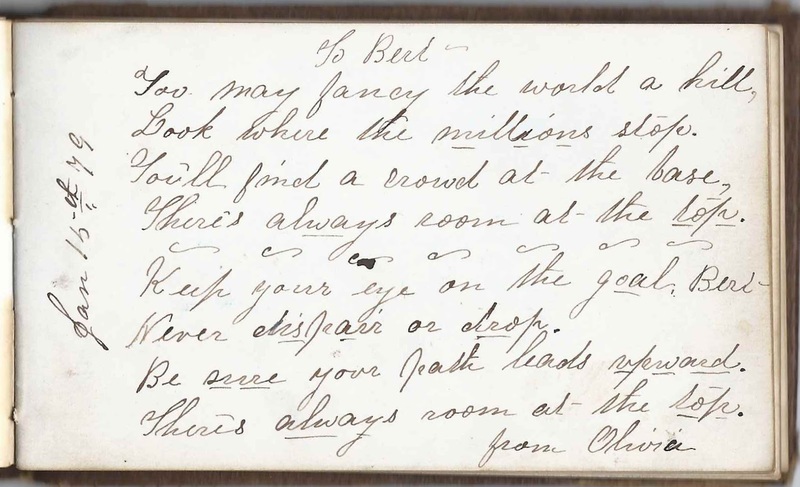 The album is approximately 5-1/4" x 3-1/4" and contains the sentiments of over 30 of Bert's relatives and friends. An alphabetical list of the signers appears at the end of this post. After a false start of searching for a brother named Bert to Ardelle Josephine Scofield, who indicated a sister relationship with him, I believe that the owner of this album was actually Herbert A. Perry, born about 1859, presumably at or near Elba, New York, the son of Sylvanus and Irene Nettie (?) Perry, who are both buried at Pine Hill Cemetery at Elba, New York. Irene Nettie died on 1 April 1860. Bert had an older brother Francis J. Perry, who signed page in the album on "3-9-79". Herbert and Frank had twin sisters, born in 1854, who both died young, Helen who died in 1859 and Ellen who died in 1860, about a month after her mother's death. Sylvanus subsequently married Ardelle's older sister Chastina Elizabeth Scofield, who became, it would seem, a good stepmother to the two boys, as they lived with her off and on for many years, long after the death of their father Sylvanus on 12 April 1872. It's apparent that Chastina's family held the boys in high regard. Presumably the Chastina who signed a page in the album was Bert's stepmother Chastina Elizabeth (Scofield) Perry. And, again, the page signed by Chastina's younger sister Ardelle Josephine Scofield, who called herself "Ever a faithful Sister". 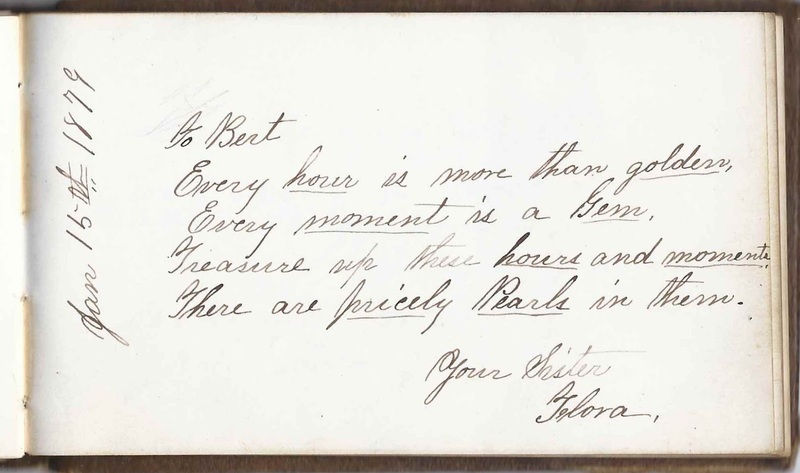 Flora Adora Scofield signed a page on January 15, 1879 and called herself Bert's sister, though she was another younger sister to Bert's stepmother, Chastina Elizabeth (Scofield) Perry. Presumably the Olivia who signed a page on January 15, 1879, was another of Chastina's younger sisters, Olivia Imogene Scofield. Chastina and her sisters were the children of Samuel and Laura Eleanor (Whipple) Scofield, who were born at Catskill, New York, and Byron, New York, respectively, but who raised their family at Elba, New York. Three signers indicated a cousin relationship with Bert, whether it was a blood relationship or a step relationship. One was Rose Bell Fenner of Indian Falls, New York, a village in Pembroke. 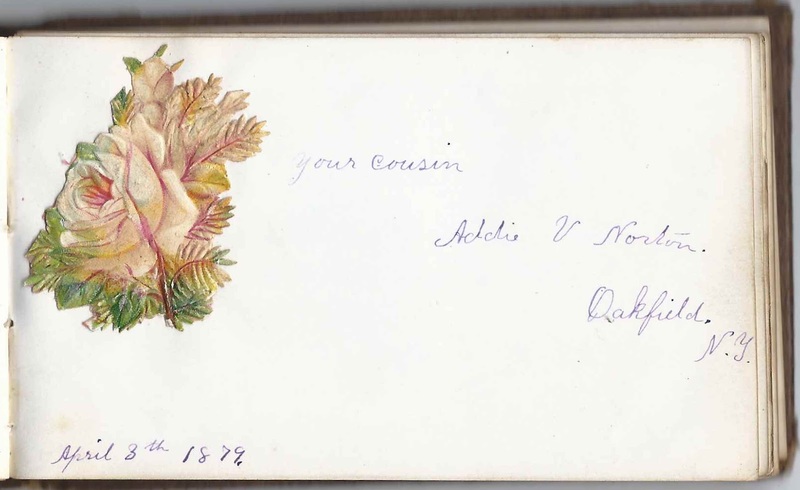 Another cousin was Addie V. Norton of Oakfield, New York, who signed on April 3, 1879. Addie was Addie Viola (Driggs) Norton, daughter of Alexander Hamilton Driggs and wife Charlotte Jane (Whipple) Driggs, younger sister of Laura Eleanor (Whipple) Scofield. Laura was the mother of Bert's stepmother Chastina Elizabeth (Scofield) Perry. Addie's husband, Arthur J. Norton, signed the left facing page. Another cousin who signed was Eunice Martin. I found a couple instances of a Herbert A. Perry in New York in the early 20th century, not at Elba, but I'm not sure if either of them is our Bert. In the 1900 and 1910 Censuses of Elba, New York, Herbert's brother Francis J. Perry, "Frank", was living with his stepmother Chastina. The 1900 Census indicates that he was widowed. If you have corrections, clarifications and/or additions to the information above, or information on any of the signers listed below, please leave a comment, or contact me directly. Thanks! Anna B. Dykeman, signed at Carmel, New York, on April 12, 1881 "Don't forget riding over snow banks"
Mrs. W. E. Hunn, signed at Elba, New York, on March 27, 1879; presumably Mrs. Anna (Lee) Hunn, wife of Wells E. Hunn. Ida V. McNall of West Henrietta, New York, signed in February 1879. Ida would marry F. D. Moody; she would die in 1889. 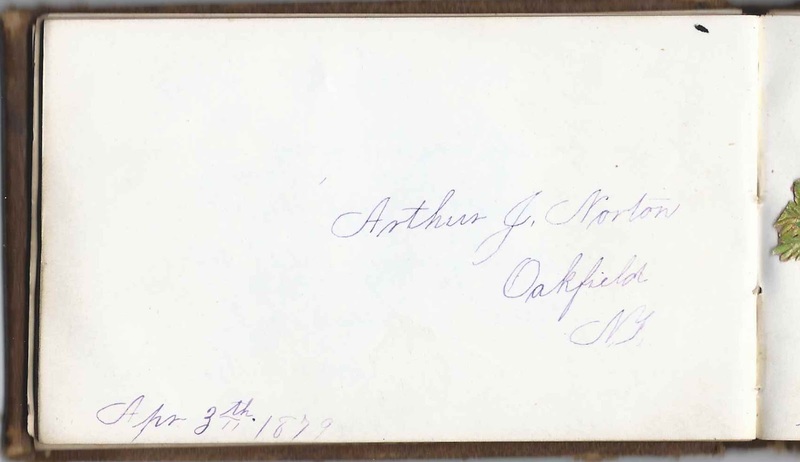 Arthur J. Norton of Oakfield, New York, signed on April 3, 1879. Arthur's wife Addie Viola (Driggs) Norton signed the right facing page. Addie V. Norton of Oakfield, New York, signed on April 3, 1879; Bert's cousin. Addie was Addie Viola (Driggs) Norton, daughter of Alexander Hamilton Driggs and wife Charlotte Jane (Whipple) Driggs, younger sister of Laura Eleanor (Whipple) Scofield. Laura was the mother of Bert's stepmother Chastina Elizabeth (Scofield) Perry. Addie's husband, Arthur J. Norton, signed the left facing page. 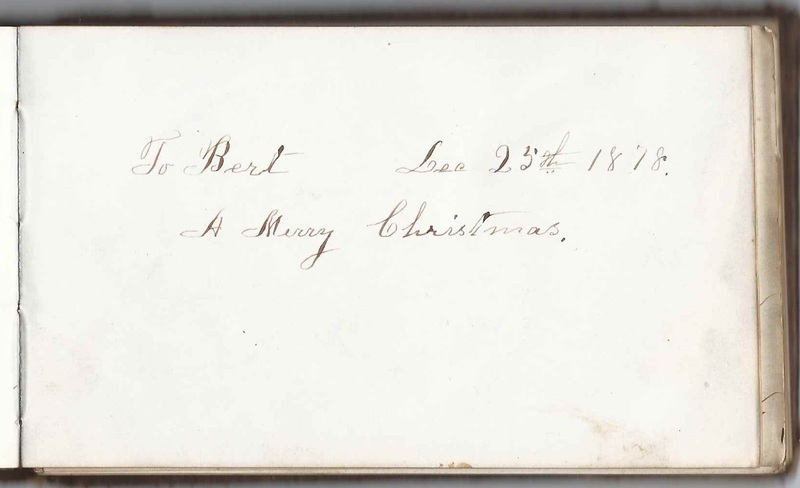 Presentation page: "To Bert, December 25, 1878. A Merry Christmas." Herbert A. Perry, album owner. 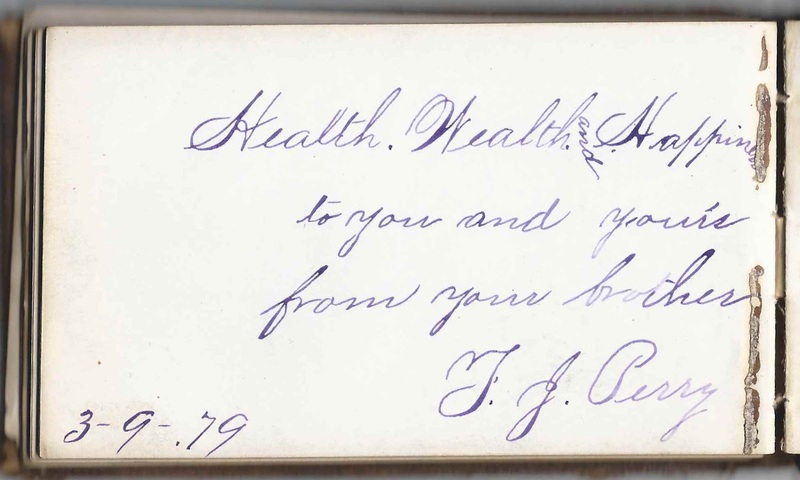 F. J. Perry, signed on "3-9-1879". Frank J. Perry, Bert's older brother, son of Sylvanus and Irene Nettie (?) Perry of Elba, New York. Lulu M. Sawtelle of New York City, signed on September 26, 1882. "I will be 21 the 21st of March." "When you take girls riding, put them in feet first instead of head first." Olivia, signed on January 15, 1879; possibly Olivia Imogene Scofield, sister of Bert's stepmother Chastina Elizabeth (Scofield) Perry. Flora, signed on January 15, 1879. She called herself Bert's sister but she was actually Flora Adora Scofield, a younger sister of Bert's stepmother Chastina (Scofield) Perry. 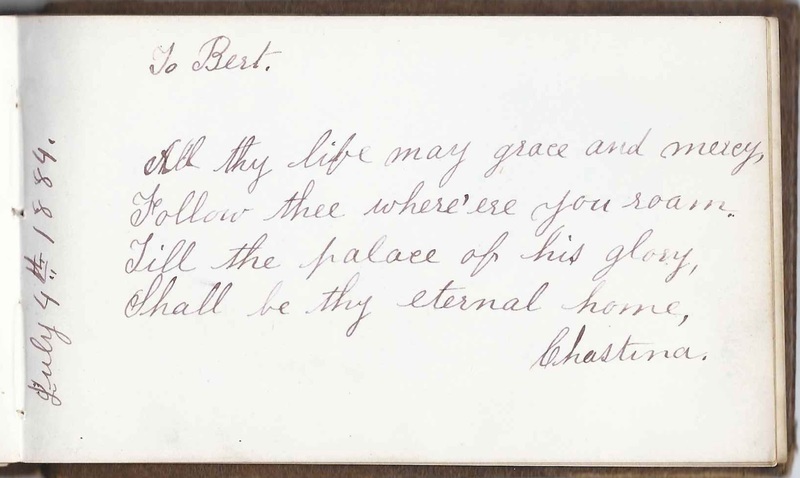 Chastina, signed on July 4, 1884; Bert's stepmother Chastina Elizabeth (Scofield) Perry. L. B. Smith, signed on September 5, 1881 (implies that he has moved west beyond the Mississippi River). 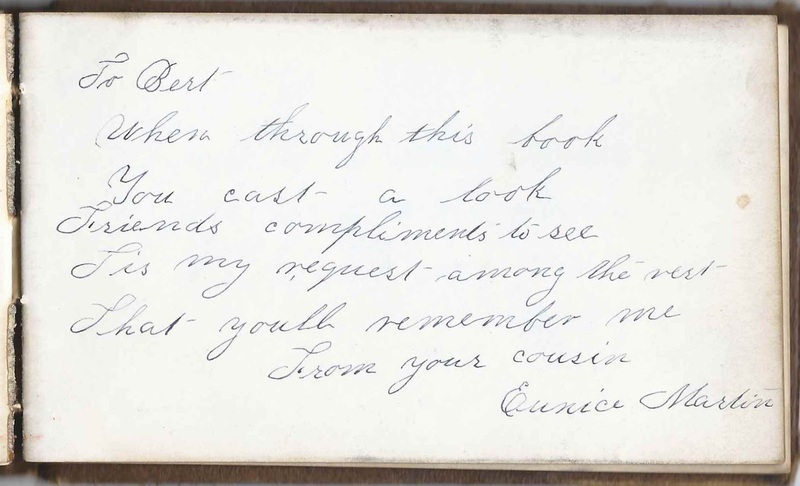 His wife signed the right facing page and gave her address as Faribault, Minnesota. 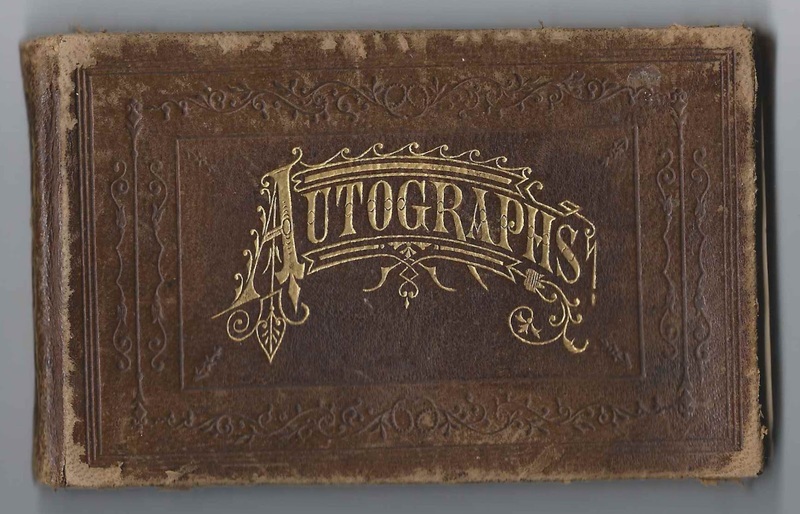 S. E. Smith, signed at Faribault, Minnesota, on September 5, 1881; her husband, L. B. Smith, signed the left facing page. George Whipple, signed at East Carlton, New York, on September 19, 1881. Presumably the George Whipple, who was the son of Leander Whipple, younger brother to Laura Eleanor (Whipple) Scofield, mother of Bert's stepmother Chastine Elizabeth (Scofield) Perry. Sadie Willis, signed at Elba, New York, on June 3, 1879; perhaps the wife of signer Alonzo Willis, who signed the overleaf. Alonzo Willis, signed at Elba, New York, on June 3, 1879; it was presumably his wife Sadie Willis who signed the overleaf.